Something strange in your neighborhood? Call the Ghostbusters! 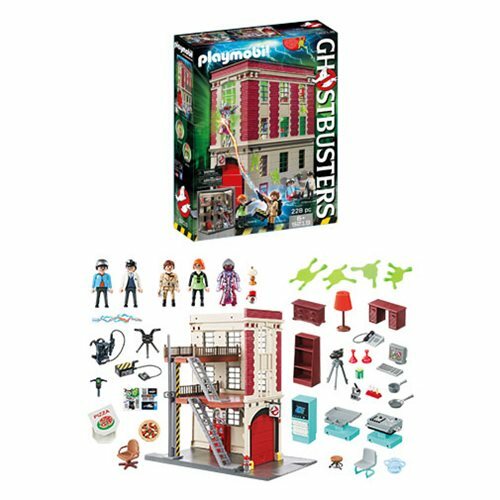 This Ghostbusters Firehouse Playset features some of your favorite characters from the classic film like Egon, Ray, Janine, and Louis. Mix it up in the lab while Stantz keeps a close watch on the Library Ghost, and Janine answers all your ghostbusting calls. Use the garage to park the Ecto-1 (sold separately) for even more ghoulish action. And don't forget to lock up all ghosts in the Ghost Containment Unit. This set is packed with plenty of accessories for hunting down ghosts, including a detachable proton pack and proton laser, ghost trap, PKE meter for measuring psychokinetic energy, silicone slime splatters that stick to smooth surfaces, and more! Ages 2-10.